The newest four-legged addition to the HISD Police Department arrived last week, wagging her tail to show her excitement. Officer Boni is a German Shepherd with a Hungarian bloodline. For the next month, she will undergo additional training including obedience, stamina, endurance, and narcotics detection. 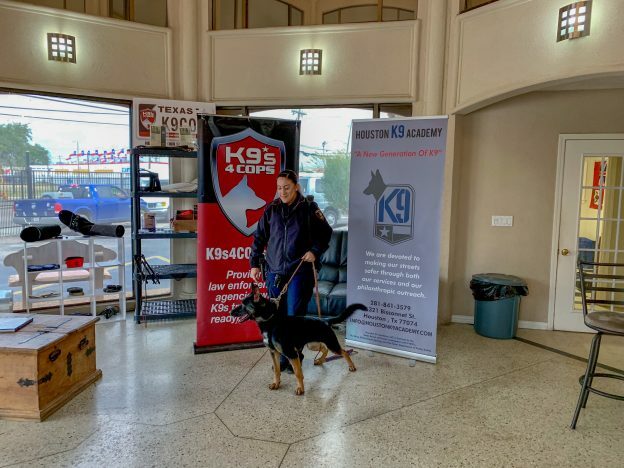 This entry was posted in Business Operations, HISD PD, News and tagged HISD PD, HISD Police, HISD Police Department, k9 unit on February 5, 2019 by HISD Communications. With HISD graduation season a few months away, one super sleuth is sniffing out any trouble behind the scenes – ensuring each stadium or facility is secure for those who will attend the ceremonies. Pretty impressive work for a 3-year-old. Aries is one of three K9s currently serving with HISD’s patrol unit. He specializes in explosive detection, while his peers, Sasha and Gypsy, focus on narcotics. The canines are all trained to support and protect officers, as well as conduct area searches for drugs, weapons, or other contraband that may be on school grounds or in district facilities. This entry was posted in News and tagged canine, HISD Police, HISD Police Department, k9 unit, police, safety on March 30, 2016 by HISD Communications. Sasha spends most of her work day sniffing around HISD schools, searching for anything that doesn’t belong – drugs, weapons or suspects. This entry was posted in News and tagged HISD Police, HISD Police Department, k9 unit, police, safety on June 9, 2014 by HISD Communications.